It’s hard to believe, but winter is here and it’s a sure bet that we will see our share of snowfall later this season. We were fortunate to have a very mild fall, but a winter storm can hit us at any time! While many people are concerned with keeping sidewalks and roadways clear, as well as shoveling out their cars, we must not forget to keep local area fire hydrants clear from snow. The South Farmingdale Water District continually asks local consumers to keep an eye out for any fire hydrants that may become buried in the wake of a plow. At times, snow plows blanket many of the District’s 1,300 plus fire hydrants, making it nearly impossible to locate them quickly in emergency situations. 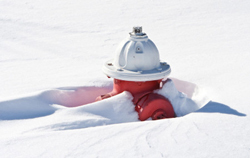 In the event of a fire, precious time is lost when firefighters have to locate and shovel out fire hydrants. SFWD Water Commissioners ask consumers to keep fire hydrants closest to your residence or business clear of snow, with an approximate radius of 3-feet around each hydrant. Consumers should also be extremely careful and aware of vehicle traffic when shoveling snow.